My last acetone job...came out great! so glad the model lined up well. A question: how long do you let your models dry after smoothing with acetone? The goal is to smooth the layer lines of a PLA/PHA mould, for casting silicone models into it. For testing, I dipped a scrap print (colorFabb PLA/PHA, red) into acetone for a few seconds, and after more than an hour drying now, it is still flexible and still emits an acetone smell. So the acetone seems to penetrate far deeper than I expected. Only the thinnest parts are now getting white (just as seen in some of your photos) and seem to be drying. Oh my! I haven't posted on this thread for over 7 months! Unfortunately There is no magic amount of time, this is something you need to figure out as it ALWAYS depends on the material and stuff. I wish I could just say 10 seconds or 25 like I did before, or 45 seconds max like my old limit was. But I'm much more experienced in doing it now, its like cooking, I judge in the day and during the moment. Like a cook does adjust according to the weather or detail of the model as some parts might be too thin for a dip. I might use new acetone for some things and used dipping acetone for others. You really need to practice (safely of course). As for the whiteness thing, my perceived explanation is a bit too convoluted to explain here, but basically i think it is related to time of exposure to oxygen (and stuff) basically, you can use Ethyl acetate and wax if you dont want it, but again I now know the long term effects of acetone as I've used it for over 3 years now. (and i have no hypersensitivities or ill effects from it!) The other chems.... not so nice!!!! Ethyl acetate absolutely stinks and is a nastier version of acetone, and methylene cloride is not so bad. To all new people who don't want to read this entire thread, Acetone smooths PLA/PHA from colourfabb printed at 0.06 layer resolution in a way so that only a light sand is needed to remove imperfections. You will not need filler and sanding for many hours, that is why you are spending more time printing it out at 0.06! so you can do less manual labour!!!! To know how i apply it, just watch the vids and find a method that suits you. Acetone also makes your prints water tight, by changing the chemical makeup and also slightly shrinks compressing the form (not much unless you soak it for ages. it can also warp and split your models revealing any weak points! it will not split a good print if done correctly. The part is ready when it is hard and brittle BTW. But I like to work on it during its transformation phase as sanding is strange and leaves no scratched which makes clean up super easy. Unfortunately I have far too much to say on this topic and i feel im just making things more confusing! Feel free to ask but dont expect everything i say to make sense at first! Strange, my last post was edited by......GUEST? So I will go the "cooking way", and just experiment. :) The shrinking might be a bit of a problem though, as the silicone castings should keep their shape and fit: they have to fit over some medical equipment. So I will have to be careful to only do the inside of the mould with a brush or wet tissue, and leave the outside untouched and stable. Maybe I will try multiple light applications, rather than one heavy. We'll see what it gives. Concerning health, I have a chemically-safe fumes extraction cabinet in my lab, safety glasses, and various medical gloves, so this is not a problem, fortunately. Dont worry about the shrinking too much but keep it in mind. No chemical is perfect unfortunately but acetone sure does the trick for me! I need to buy some more actually!!! Thanks for reminding me! A dip is very effective, but nowadays i brush more than i dip. But i still dip. Usually 10 - 15secs and see how it turns out after if im not happy ill do the next one longer... if it warps ill do it shorter....you get the jist! If you do a dip or brush you can tell how much has been absorbed by the coldness. The colder it is, the more acetone has been absorbed. If you want to test the shrinkage, print something flatish (not necesarily thin as i will warp) and the let it sit in acetone for 30 mins. I had a lid to a box shrink over 2cm width and height. But i deliberately tortured it with acetone. No other of my many dips and brushes on pla/pha has shrunk enough for me to notice! Use tr pla/pha for best results in my opinion. It sets quicker. Im going to post a new tut very soon, i recoded it agers ago but never got round to editing it yet! Ok so I have a bit of time spare during my night shift so I thought I'd have another go at explaining how things work and how I go about my post processing as simply and clearly as I can. And by the way this focuses mainly on layer lines rather than top surfaces. Top surfaces will defo need a light sand to be perfect, and do it before the dip or brush. try to do as much sanding where you need it before! it will make your life easier later. Ok so first up, the whole PLA and acetone argument and purity of PLA and different filaments. I am not trying to say PLA smooths with acetone, because we all know that it doesn't. Some people seem to have some focus on the purity of PLA and wanting to acquire the purest form of PLA yet have no real idea of what EXACTLY is in the PLA they are using anyway which kind of defeats their argument to begin with. We are not buying narcotics here, so purity is not really a factor, but consistency of filament production is more important and that the manufacturers don't change the formulas half way through a batch as this will affect future post processing efforts. Colorfabb is NOT the only filament that smooths with acetone, many others do, but I am concentrating on Colorfabb because I know the filament well and their formulas are fairly consistent from using that brand for the past 3 to 4 years. The resolution you print at before applying the acetone is the most important factor. I print at 0.06 and find that although every line may not smooth perfectly due to serveral factors, clean up is FAR less painful and monumentally quicker that simply applying filler and sanding multiple times. Longer printing times mean smaller post production times, a lot smaller. Sometimes if I have even one error on a print I will print it again because I don't want to waste my time sanding and filling for hours on end. Top surfaces tend to look better printed in 0.06 anyways. Sanding.......yes you still have to sand your prints. But with much finer sand paper which makes sanding minimal and not a total pain in the arse. I don't like to apply any filler or topcoats of various materials, as I tend to plate my work and this is a pain to keep perfect in an acid tank as fillers usually absorb liquid and expand ruining any patches you may have fixed. To patch up small holes and seams I simply use superglue and activator and then sand it out. I find it much better than filler although much more difficult to sand down, but the advantage is that you will be able to sand it down perfectly and NOT see any seam whatsoever. Also superglue does not react to acid or other top coats. You can just spray primer and sand down the slight imperfections and it will usually be OK. No needs for stupid amounts of time wasted sanding. I've read people spend up to 3-5 hours just spraying and adding filler to a tiny ball type object.....total waste of time in my opinion Just print higher rez. Sanding soon after dipping or brushing will result in a powderless sand. As the PLA/PHA is still absorbing the acetone, it is much more flexible and it is kind of possible to rub the surface smooth with the sand paper in a way that you are sanding but merely rubbing the lines out with the sandpaper and not causing any actual damage. Its hard to explain but you will see what I mean if you try it. Doing this kind of sanding takes longer to the surface being more resilient to fine sandpaper but still vulnerable to markings from fingernails and sharp objects. Usually when you sand an object then you go through grades of sandpaper, but again this is simply not necessary if you acetone your prints as you are removing the need for the harsh grades and skipping straight to 240 or 320 or even 400. I tend to use the same piece of 240 for ages and this simply means that it turns into a finer grade by being used up. Using fresh sandpaper can often be too harsh on the surface. You are literally breaking down the chemical composition of the plastic and relying on the excess to melt into the gaps between the layers. If you go to hard on small pieces they will warp. This shouldn't come as a surprise. Dont dip or brush on for too long. A few seconds is sometimes enough. More than 45 seconds is pushing it, and a few days or months down the line when the acetone has finally evaporated off or been absorbed, the model may plit crack or warp further. I believe this is some form of oxidisation, and if the acetone is left in tiny gaps, then the PLH/PHA impurities may collect and obstruct detailed areas (which is what you dont want), so make sure to coat the object evenly and not let the acetone sit for too long. It can look deceptively ruined, but a quick primer run will surprise you how its pretty much only superficial. If you need a clean look and are not spray painting it, go down the Ethyl Acetate route but again, its a different chemical so different rules apply for this, that im not getting into at the moment. I'll finish it there for now. But I hope that helps anyone out there to at least get started. Ill post a new vid applying to another large print and show you the results. And don't use nail varnish remover its too weak. use as close to 100% Acetone that you can get hold of. ....And dont blame me if it doesn't work for you. It just means you are doing something wrong! or for too long! And remember have fun experimenting!!!! safely of course, if you find your throat hurting when you go to sleep, its because you were not wearing a protective mask, or the wrong one. Also remember nitrile gloves, but these are only effective for like 10 seconds.......so be quick! 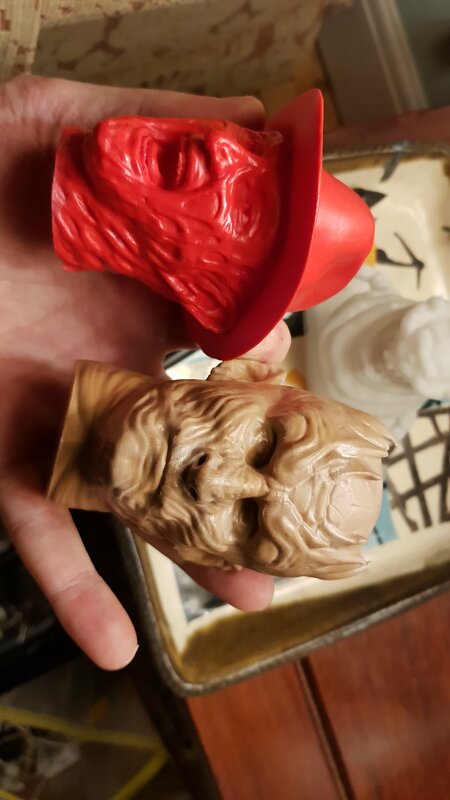 So do a test for yourself, Print a small object in 0.06 layer height in colorfabb TR red PLH/PHA and then dip half of it into acetone for like 10 secs and wait for the surface to harden. Then spray it with primer and see the results for yourself. However this isn't magic and if you are useless at post processing or light sanding then don't even bother and simply accept that your prints will have visible layer lines....and mine won't! ? The real moulds will be for august, I need feedback from the users in the hospital first. In my opinion the initial time you apply the acetone is the most effective. Anything later would just be to even out some post acetone sanding marks if there are any. I wouldn't recommend multiple brush applications, or dips for that matter, as the original chemical reaction has happened, and you are just playing around with the residue left over the model. You could potentially make it worse and risk splitting. Make sure its a nice thick brush on if you are doing it the way or at least a 10-15 seconds just to see the effects first time round. Ill try post a vid soon, but its not very difficult at all. .....and don't expect any shrinkage unless you literally drown the PLA in acetone for ages. Because its not as effective as with ABS light applications might not do much. 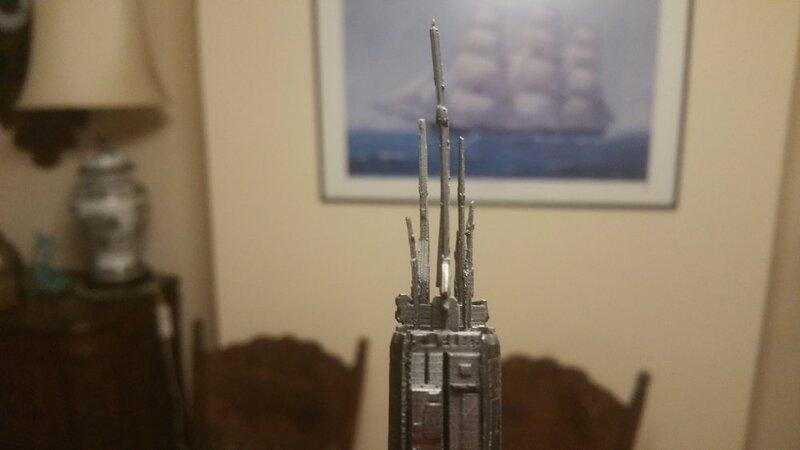 You have to commit to potentially ruining your model Im afraid. When i did my big Trex skull which was over 57Hrs for the first time, I was a bit concerned which is why I filmed it, but soon realised that there was nothing to be afraid of. I honestly think that is why people don't use this method. Fear. @geert_2 I just acetoned primed and plated two objects all in the space of a few hours, for my bobble heads. So in my experience of brushing on acetone and worrying about shrinkage, im not worried at all. You just need to feel when the shell goes hard. Trouble is i rushed the cacid copper mix and probably ruined it. I just did it cooking syle and chucked all the chems in and mixed it up, i forgot chems dont work that way, its not cooking its chemistry. Lesson learned. Both object Plated but had tiny sections that just didnt plate, ill try doing small patch fixes but will more likely just chuck the whole lot in again! will post pics soon! sorry for not gettting round to posting my second large object acetone tutorial, I'll try get round to that tonight! As long as it does not go swimming ? ? Funnily enough Im still to try out the washing up or dishwasher liquid test, which is meant to halt the absorbsion of acetone, but I remember from past experience with abs that washing up liquid dissolves ABS juice so im not too sure about that theory. Must have been dishwasher liquid then, but I need to double check that! either way just dont leave it too long. People are over worrying I think. try not to double or thriple dip as these chems tend to dry the hell out of the filament which is another reason they split later....but dont let that worry you too much, as mainly methylene chloride and ethyl acetate dry out the more than acetone. I also keep my sharp edges, so these should not dissolve and soften out lioke with ABS and acetone. Results before and after "acetoning". These are just old scrap pieces, which I kept around for testing. Material is colorFabb PLA/PHA, Dutch Orange. Printed with 0.4mm nozzle, 0.1mm layer height, 50mm/s, 210°C, 100% filled, on UM2. The visible part of the model is ca. 70mm long, 10mm wide, 3mm high. 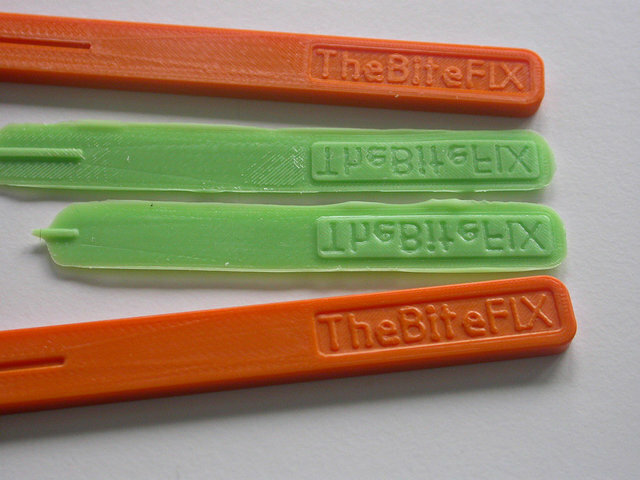 The green pieces are silicone casts of it, as they show some irregularities better than the original models. While the seam lines are still visible in the silicone-treated part, they are almost "unfeelable": it feels way smoother than the untreated part. All little openings due to minor underextrusion are completely sealed, which is best visible in the silicone casts. Text is gently rounded. Text caps height is ca. 5mm, raised 0.2 or 0.3mm (I don't exactly remember). There was whitening indeed, but that was only superficial and could easily be brushed off with a hand brush, while the model was still somewhat soft. It has to be a soft brush, since a hard nylon brush caused scratches. And it should be a soft brush that does not melt in contact with acetone. :) I guess that the whitening is caused by additives that are dislodged or broken down, and that get deposited on the surface? There are no signs of warping. Immediately after treatment I could push my fingernail about 0.5mm deep into the model, while it was soft. But now it feels hard like original. Anyway, I am glad with the results: if I take care to print more carefull (slower, lesser layer height), this will make silicone casts a lot easier and better. Thanks to cloakfiend for the research on acetoning. Hey, Glad you gave it a go! Top surfaces generally look much better when printing at 0.06 anyways, so it will look even better so I'd also try doing that, and if you lightly sand it before acetoning it it will be near perfect! Also with long thin prints like yours, don't dip, they will warp over time as dipping monumentally increases absorbsion times. The whitening is hit and miss, you may or may not always have it. If you reuse your acetone and the dirtry brush you used last time then you will definitely get it. I always get it now. Doesnt bother me. Also if you want it shinyish, then simply buff it with a soft brush during the acetone evaporation! Finally I got my heat gun working again, so I tried "heat gun smoothing" a few test models to compare it to untreated and acetone smoothed parts. The heat gun is a small gas burner with catalytic combustion: it burns without flame on a platinum catalyst. Heat can be regulated from "rather hot" to "very hot"; I don't know exact temperatures. Tests were done on quite low setting. This type of gas heat guns is also used for soldering, and for shrinking socks in electronics. The translucent green 3D-printed model is ICE PET. All orange test models are colorFabb PLA/PHA, Dutch Orange. In the pictures, the dull left model is acetone smoothed, the shiny center model is heat gun treated, and the right one is untreated. The soft green items left and right of the orange parts are silicone impressions of the acetoned and untreated models (I don't have one of the heat gun treated part). - The heat gun almost immediately melts the PLA/PHA. Tiny strands and edges tend to get brown after only one or a few seconds. - Contrary to most plastics, heat seems to travel very fast and very deep into the PLA/PHA, making the whole model deform very soon, after only a few seconds. 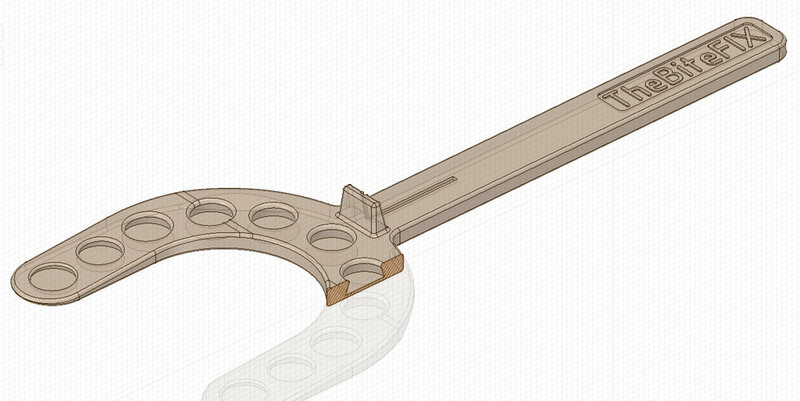 These models are 10mm wide and 3mm high. So, on thin edges it will be worse. 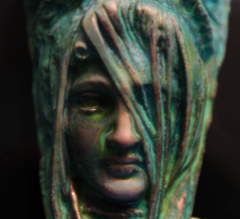 - Cloakfiend's method of "acetoning", does smoothe and round the edges, closes gaps, and gives a somewhat dull look to the model (this is after wiping the models with paper tissue and soft brush to remove the superficial white deposits). - Heat gunning melts the top layer, and then the entrapped air below suddenly expands and "explodes", causing bubbles and craters in the surface. This goes very fast. This is best visible in the green PET, although hard to photograph due to the high gloss. This is also contrary to heat gunning solid injection moulded or vacuum formed parts. - Heat gunning smoothes fine scratches from grinding, it gives some shine back to the dullness. Do *not* use a heat gun to smooth PLA and PET models. It is very likely to ruin the model, by melting, burning and deforming it almost immediately, even on low heat setting. Heat travels way too fast and way too deep. And it does explode the entrapped bubbles inside, a bit similar to printing nylon that is too wet. So, while we successfully used this heat gun to smooth dental models in soft plastic, it seems it can not be used for 3D-printed parts. Maybe the only use of the heat gun could be to smooth scratches from sanding. But only *very fine scratches*, showing up as dullness. It can't remove deep scratches. And even then the risk of deformation is high. Instead, use mechanical treatment first to remove big defects, such as cutting and sanding, and then try acetone smoothing. But try this on test parts first. Small gas heat gun with catalytic no-flame burner. Exploded bubbles in PET, similar to 3D-printing too wet nylon. Left = acetone smoothed | Center = heat gunned | Right = untreated. All colorFabb PLA/PHA. Acetoning closes gaps, heat gunning doesn't. Showing the gloss, or lack of. The typical superficial white deposits on the acetoned part, were brushed off with a paper tissue and a soft brush. Burn marks on the heat gunned part, both in front and below the "t" in "bite". Damage showing up only after a day on the acetoned part. Acetone also seems to penetrate quite deep into this PLA/PHA, and to work quite long. The opposite side has indentations, which are shining through now. So testing and not overdoing seems important. Indeed acetone closes gaps and makes your model watertight. But most of the problems with using acetone are experience related. Unless you play with it a lot and experiment you just wont understand the pitfalls. Many things cam ruin your print or effect it. Im still puzzled by the whitening issue which is not in my experience removable or wipeable. The only way I can remove it temporarily is with moisturiser which leads me onto cracking and splitting. As acetone deeply penetrates into your pla/pha it will contract. Maybe by nanometers maybe a lot more. Ive had a flat rectangle shrink diameter by over 4cm! Within an hour or so. This is all you really need to understand and get used to. The whitening is purely superficial even if there is loads, and can be cleaned up somewhat immideiately after the surface is not tacky. It may return it may not but as long as residue has not built up in the area thats all thats important. I havent dunked anything in ages. A brush on usually works pretty well because you are not saturating the pla, Repeated exposure makes judging acetone absorbtion more complicated and the post results more unknown. I dont get any surface issues at all but sometimes if using internal supports it can affect the drying process as in my alien model that kept collapsing in the same place...where the support was. If you print too cool your model will split. Dunking produces smoother and more consistent (surfacewise) results but comes with more risk related to the amount of time you dunk for. I found that each colour of pla needs different dunk times. This skull was the first thing I acetoned back in the day. Still looks ok to me. Cracked a bit but if you saw the video i filmed it in which was my first ever acetone related clip then youll quickly understand why. If its long and thin, put a heavy book on it while its drying out Works for me! Obviously not too heavy to the point it squashes it. The first time it warms from the acetone chill is the most important time for the state of the model. BTW If you get dips in your model then examine what was there in the model as acetone never causes these issues on hollow printed models. Well not for me anyways. Also dont let it sit on the model too long in patches as it will cure unevenly sometimes leaving puddles with visible edges! The top side of the testmodel looks like this. It is some time ago since I did the smoothing with acetone, so I don't remember the exact details. Today I only did the heat gunning. But I sure did apply quite a lot of acetone back then, and it pooled in these pits in the arcs. So it is probably the excess and the pooling that caused this. I also saw the same effect earlier when using some glues, to glue silicone onto the model. Ahh yes, thats why! the areas are flat and very thin! (these are some classic acetone problematic areas) go extra light here. its doable though! try one side at a time, or just use a tiny brush instead of a monster one like i tend to. I use tiny figure painting brushes for dangerous areas it takes longer and you need to keep on dipping the brush in acetone as it doesn't hold very much, but there is zero danger of overdoing it. but again try and go as quick as you can evenly. Also there is no point doing the bottom a lot as its flat You can just rub that over sand paper. Here is another old acetone job, obviously you can see what went wrong, but I was not being that careful, so it can be done. just a bit of practice and not overdoing it! Not all of them warped, I'd do them now with a much finer brush for control and I reckon they'd be OK! @Cloakfiend: I did some tests to see the effect of an *overdose* of acetone: I left these test pieces in acetone for several hours. Results: models in PLA crack and deform. The cracks often start at layer lines and corners, but then go diagonally through the material. 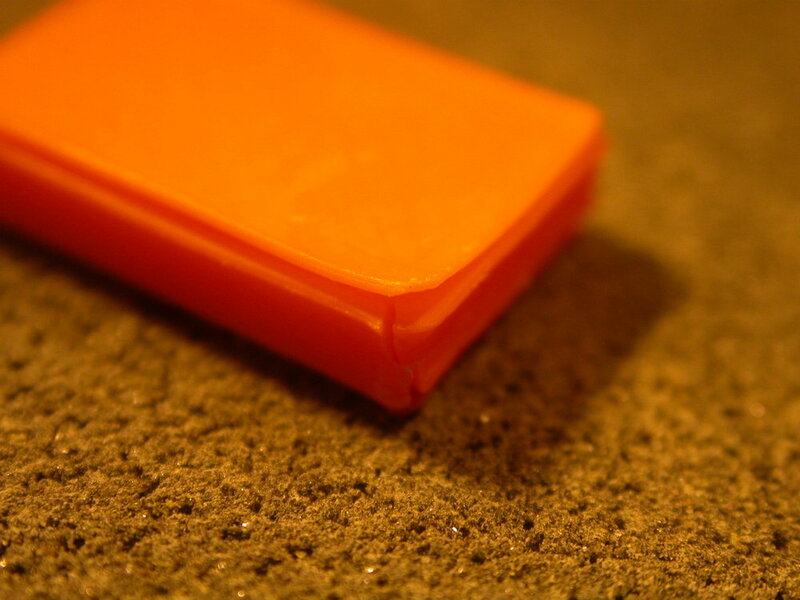 When dry again, the material loses some of its elasticity, and becomes a bit like hard plasticine (=it does not fully return to its original shape after bending). Also, multiple brush-ons with acetone don't have much effect indeed, like you said. Only the first one really works well. So, indeed: after removing/sanding defects, now I just apply one liberal brush-on of acetone, and then leave it at that. It tends to fill the little valleys, without removing the peaks. And then I wipe off the white residu before the model is totally hard again. Works very well for my moulds. You did a really good job in developing that method and balance. Further, smoothing PET does not seem to work: short applications of acetone have no visible effect. Leaving models in acetone for hours, deforms them: square blocks get deformed into a sort of pillow with rounded edges. Ugly bubbles appear below the surface, and keep growing for several days. Pic at bottom: block of PET left in acetone (red, pillow-distorted) versus original shape (yellow). Both are the same brand of PET (ICE), but different colors. Notice the rounded edges and the bubbles in the red model. Th overdose can be done in a matter of minutes. The heavy coat can be too heavy. but in my personal experience, hollow closed objects are far more likely to warp than open open models with no capped bottom. I've dealt with almost every type of scenario with acetone now, and it still takes a bit of thought to do. The most important thing is to do one good coat and just leave it. Another thing is that its easier to sand afterwards which is a bonus. also good thing to note is If your model is hollow the acetone vapours can get trapped inside for weeks or months if you don't let it evaporate out nicely. Or whats happening is that the acetone has gone through the PLA layers into the model and as its sealing the plastic it touches, its effectively sealing in the acetone vapour as well. Id recommend trying to either open it up if possible or drill some air holes for the acetone to breath out from. I can see this on my metal plated objects, that I acetoned and plated the same day. Thats a nono if they are hollow, even if filled with plaster and left a while. Dipping for hours will totally dissolve the additives so the model will shrink as the additives dissolve. But to be honest i haven't done mega long dip tests because they are totally unnecessary as even a 50second dip can be way too long. 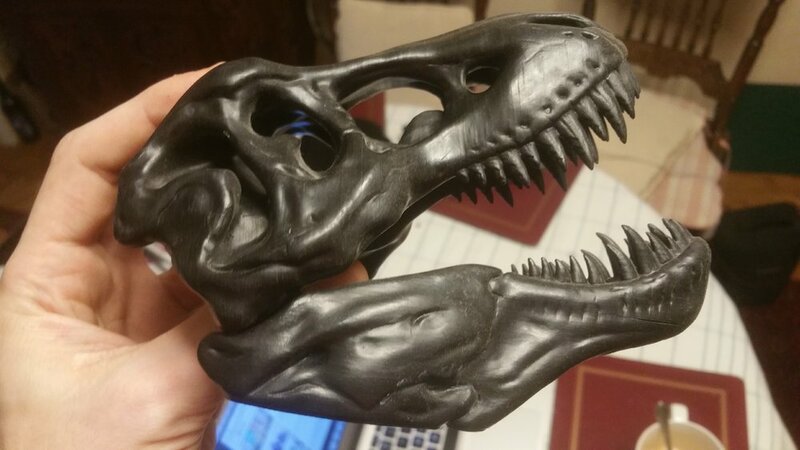 Old Ultimaker filament was king. It shrunk less and never cracked. Its was so easy to use and worked in 15 seconds compared to colorfabbs longer dips which could potentially crack if dipped for longer, due to drying out. You can always try to add moisturiser but it won't last more than a few hours, dehydrated PLA absorbed moisturiser very quickly. dirty acetone acts differently to clean acetone as well, I haven't done that many test on this though. The main thing is doing closed object tests and hollow objects tests and weird infill object tests. The infill tends to collapse and drag the outer shell with it if the acetone vapour gets in. I learnt that from my alien model. Acetone penetrates far more than you think and keeps going for far longer than you think.. Someone said dishwasher liquid halts the chemical reaction, but i haven't tried to be honest. It it a truly great method once you get the hang of it. for colourfabb you don't need more than a 40second dip in my opinion. but brushing also works. it all depends on the model and detail and shape of the model too. ....and if your model splits along the layer lines quite quickly then you have most likely not printed hot enough. but thats always debatable. Yes indeed, this is what I also noticed. One of my other test models, not shown in the photos, was a carabiner (snap hook; or in Dutch: karabijnhaak). It stayed soft for several *weeks* after I let it sit in acetone for a couple of hours. And it also had the above cracks. 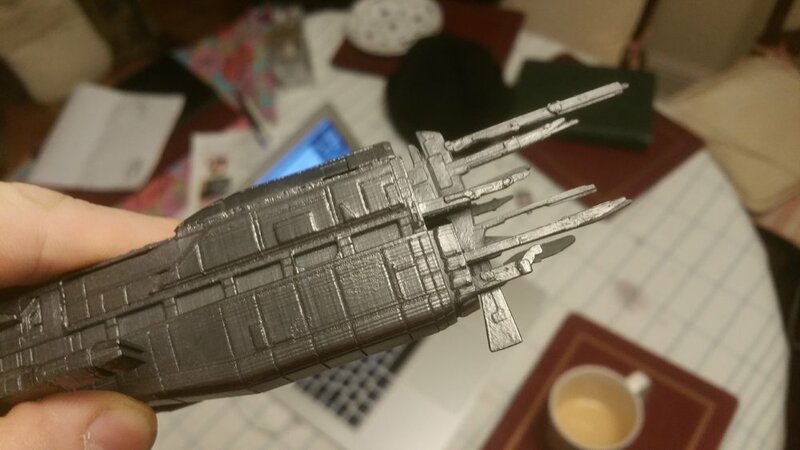 By the way: the models in these photos are solids, printed with 100% infill (just like almost all of my models). Thats interesting, because i've never printed a model with 100% infill. I did print a lid for a box once and tested long exposure times with acetone, and it shrunk by a third of its original size and also warped (so i never did that again! lol), I might even have a photo somewhere? hmmm. Just a note to all the newbies to this method. I have acetoned models from over 4 years ago, so to all the people reading this, its overexposure that is responsible for any damage. A generous brush is usually fine i find and no longterm damage will occur. but if you're model is hollow and you've been over generous with the acetone, open it up and let some air into the inside or else the vapour will continue to work as it has nowhere to escape. Ill post some ancient model photos later! Just wanted to say that the majority of the whiteness caused by acetone does come off with a subsequent acetone coating. So apply the acetone then wait a few minutes for it to evaporate off, then when its still in its soft stage get a brush and apply another coating. The acetone cleaning up layer diesnt need to be heavy at all. Jusy tested it on some test sculpts today and it worked even on really old colourfabb filament which is the light brown one. Wow, that red one looks really smooth, with absolutely no layer lines visible. Did you sand it prior to acetoning, or was it straigth out of the printer? Only the hat was sanded and inside the mouth and under the chin. freddies face was not sanded at all, its just too detailed. At 30mm/s on the s5 it printed pretty well. the hat was sanded because i ran out of filament and created layer lines when fiddling around with the spool. traffic red colourfabb is a classic of mine. but i still think tansparent red is best for smoothing. the light brown is ok but not as good. My Doctor and Herbert West hill from Re-animator will be next, I'll film doing that one, seeing as my last video didn't show me applying the second acetone coating, and the lighting was poor!. I would wait until it starts going white after a few minutes, then id brush it and then re-apply, and brush it again. brushing it in its soft state is what creates the shiny look.